The Greek philosopher Socrates who lived from 470 until 399 B.C.E. sought to withdraw from the hurly-burly of ordinary political life in what was one of the very first democracies. He insisted that it was impossible to participate in the political life of Athens and at the same time retain one’s integrity. And in his view integrity, living a virtuous life, was of paramount importance: it led him to eventually accept the decision of a corrupt court and drink Hemlock. Politics has always been a bit of a dirty game, but it is a game that is played for high stakes and a great many have discovered how to become very wealthy playing the game, doing what they are told, and collecting their reward from the special interest groups. I have not counted recently in our political system (which is not a democracy, strictly speaking) how many can be readily identified as corrupt. But the number must be rather large. We are now caught up in a bind with “representatives” who only represent special interests and who are determined to bring government to a halt if their candidate does not win the presidency. Partisanship has replaced citizenship in this country and there are very few like Socrates around — or even those who are convinced that they can play the dirty game of politics and still keep their hands clean. I can count those few on the fingers on one hand. But there are a few. Socrates, it has always seemed to me, was a bit too uncompromising. Surely it is possible for a person to be actively involved in politics and to remain a person of integrity? Or is it? Think of the temptations from the immensely wealthy who have millions of dollars to spread around buying the people who will make the decisions that will favor their particular business. There is no question whatever but that the corporations call the shots, especially since the Supreme Court decision Citizens United that gave the corporations the right to directly influence elections. Is it possible for a politician like Elizabeth Warren, for example, to continue to play the dirty game without getting soiled? That is an interesting question and one which will not be answered for a few years yet. But the siren song of wealth and power is always playing in her ear and she will have to be one tough cookie to remain far enough out of the mud to remain clean. There are a great many people in this country that are sick and tired of “politics as usual.” They are convinced that it is a dirty game and that everyone who plays it is soiled. Of late, to be sure, it gives the impression of a large group of very well paid men and women who spend time talking and doing nothing. Thus these voters turn to an outsider, one who is outside of politics if not outside of reality itself, and they hope and pray that this man with the funny hair and tiny hands will deliver this country from the muddy world of politics as usual. In the process, they expect, they themselves will be recognized and their hopes and dreams will become a reality, because politics as usual has passed them by and they have been left in the lurch, clutching at straws. Unfortunately, politics is a dirty game. That is a fact, and anyone who chooses to play must get their hands at least a bit dirty. The problem that faces this country at this juncture is whether we are realistic enough to accept the fact that politics is a dirty game and seek the one candidate who is the cleaner of the two and who promises to play the game in such a way that the country will remain relatively strong and survive as at least a shadow of the republic the founders envisioned. Or will the citizens of this country be so sick of politics as usual that they will blindly choose a man who is completely unqualified to head up this government and play a game whose rules he does to fully understand, a man who is used to making up his own rules on the go? Socrates was right. But he was also wrong. It is possible for some to play the game and retain their integrity. But it is mighty difficult and there are few who can manage to play it successfully. In the meantime, we must accept reality as it is given to us and accept the candidate who will do the best job for the country and for each of its citizens — the best under the circumstances. It’s time for realism, not pie-in-the-sky-fantasy that ignores the fact that an unqualified president will flounder and fail miserably in the dirty world of politics, a world he is totally unfamiliar with and one that will eat him alive. In a recent post on Facebook one of the contributors noted that she didn’t like Hillary Clinton at all but since Hillary was friends with Elizabeth Warren and Bernie Sanders she thought that together they could accomplish a great deal in the next four years. In addition, she was vehemently against the thought of Trump as our next president and was therefore determined to vote for Hillary despite her misgivings. I tend to agree with her take on Hillary as a person, but as I have noted in past blogs, this election is not about her personality — or Trump’s — and when it comes to policies and experience Hillary, as has been said, may be the best qualified candidate ever to run for president. Thus I regard this writer’s reasoning as weak even though I agree with her. It focuses too much on personalities to be considered strong reasoning in a political race of this magnitude. I tend to agree that Hillary’s public persona is a bit off-putting: she seems to be a very private person not given to opening up in public, not warm and cuddly like her husband. I have no problem with that however, and while I also disagree with some of the decisions she has made in the past, this race is too important to overlook her exceptional qualifications for the job at hand. Since this election is a reality show in the mind of one of the candidates, I have chosen to take a page from David Letterman’s book and list my “top ten” reasons for voting for Hillary Clinton,in reverse order. 10. She was two-term Senator for New York State. 9. She was First Lady for eight years and learned from the best how to govern. 8. She was Secretary of State and worked closely with Barack Obama. 7. She has always been willing to disclose her tax records. 6. She has never filed for bankruptcy. 5. She has no debts in foreign banks. 4. She has never been fined for racial discrimination. 3. She has fought for years for women’s rights and the rights of the disadvantaged. 2. She has openly declared her political agenda, including what the Sierra Club regards as the “strongest” stand on the environment of any political candidate for president in recent memory. 1. She understands the nuclear weapons are deterrents, not weapons of war. Now these may not be the strongest reasons possible and it always pays to take a look at the reasons given for voting for her opponent. But hard as I try I cannot find any reasons — aside from the millennials in his political ad shouting that he “tells it like it is,” which is about as false as can be. But there does seem to be one outstanding reason that ought to be addressed. Many voters are fed up with “politics as usual” and want change. Trump promises change and he is assuredly not a politician in any strict sense of that term. He has never been elected to any political office whatever, which many regard as a strength; I regard it as a weakness. But, moreover, I would urge caution to those who simply want change. Change in itself may not be a good thing. My temperature may change and symptoms appear that lead to a shorter life. The weather might change as it has radically in the Southeast and this change is assuredly not for the better. Indeed, much change can result in drastic results and the change that Trump promises would certainly appear to be change of that order. If president he may well bring this country tumbling down about his shoulders because he is simply in over his head and has no idea whatever how to work with others and benefit from their experience and insight. And his close relationship with Putin must give us all pause when thinking about this country’s relationships with the rest of the world. If there are other reasons for voting for Donald Trump, I am not aware of them. And while I realize that one should keep his or her mind open to new information, I am at this point determined to vote for Hillary Clinton for the reasons given above. And, despite my reservations about her public persona, I do realize that she is a woman of immense political experience and knowledge who is bright and capable. These reasons count for something, though, as I have said, this election is not about personalities. Hannah Arendt tells us that the lesser of two evils is still evil. She’s right. And the rumor is going around (especially among those who incline toward a third party candidate in the presidential race) that Hillary is evil even though the lesser of evils. This is a libel and should be rejected as such. In fact, this woman is extremely well prepared to take the highest office in this land. Not only was she a Senator and the Secretary of State, but she was also married to a two-term president and knows how the ugly game of politics is played. And there’s the rub! She is a politician in a day when politicians are all painted with the same tar brush. But in doing this we ignore folks like Elizabeth Warren and Bernie Sanders who have shown that it is possible to swim in the putrid waters of Washington politics and not get dirty. Moreover, the former editor of the Wall Street Journal (that “most conservative” of newspapers) stated in print that while doing research on Hillary Clinton for an article she was writing she discovered that Hillary is one of the most honest people in Washington. Now, that may be condemning with faint praise, but it is praise indeed — coming from that source. Unable to find anything more than the above regarding Trump’s platform on mental health, I did the unthinkable and went to his campaign website in search of. Remember Hillary’s 38-point platform? Trump has a 7-point platform. No, mental health is not one of the seven. So, I cannot make a comparison between his platform and Hillary’s. Suffice it to say that Ms. Clinton has a comprehensive platform and a plan to improve mental health care, while her opponent has nothing beyond mockery and scorn. In a word, Hillary stands for important principles — dealing with the economy, education, the environment, health, national security, and social equality, including gay rights — while her opponent can only stand by and call her nasty names. He has no platform on which to stand and his perspective is warped by his hatred and fear of those who differ from himself. But the important point is that, despite her lack of popularity, Hillary Clinton is well prepared for the office of president whereas her opponent(s) — all of them — are not. This should be kept in mind in November though one will almost certainly not see it written in large letters in the newspapers across this great land of ours, because Hillary is dull compared with Donald Trump who is a circus clown primed to entertain and confuse us all into taking him seriously (and sell newspapers and air time!). The media have always preferred clowns, because that’s what folks seem to want. But for those of us who can see beyond the printed page or the sound-bite on television, it is clear who is and who is not best prepared to be our next president. Dull perhaps, but also very bright and fully aware of what lies ahead for the next president. By no means the lesser of evils. There are several theories about history. One is that history repeats itself in cycles so if we want to plan for the future we must learn from the past. Another view is that history is a straight line on which present and future events are totally unlike the past, in which case there is not much to learn from reading history. A third view is that history is a spiral in which present and future events resemble, to a degree, past events but are always full of novel and unpredictable situations. In this case, we can learn from history, but are not able to say that the future will be just like the past. I tend toward the third view. I think there is much to learn from reading history, but we must acknowledge that the future will be full of surprises. Humans don’t really change that much, but circumstances do change enough to make prediction difficult. I have often wondered during Barack Obama’s presidency why he hasn’t used the media to arouse the public more than he does. Reagan knew how to use it, and Obama has considerable rhetorical skills and could go before the public and make his case for some of the programs he has been unable to work through a small-minded and obtuse Congress. Immediately after the shootings in Sandy Hook, for example, he could have gone before the public with an appeal to encourage them to put pressure on an intransigent Congress, urging some sort of gun control. But he maintained his usual low profile, despite the fact that the vast majority of the citizens in this country, and even a majority of those who hold NRA memberships, wanted some sort of gun control measures. Obama simply rattled his verbal sabre a bit and the time passed for action without anything being done, despite his promises to the distraught parents of the slain children. So, as one looks around to see if there is any politician determined and brave enough to take on the likes of the NRA and the other corporate giants who have taken over the reins of government, any possible “Trust Busters,” one sees only a couple of faces that stand out — such as Bernie Sanders, whom many reject as a bit “out there,” and Elizabeth Warren, who is relatively new at the job, but does seem to be bright enough and determined enough to take on the powers that be. Can she establish the rapport with the press that Teddy Roosevelt had in order to arouse the giant that is the citizenry in this country, asleep on its couch watching the latest sporting event? Or will she be bought out or silenced somehow, as we in Minnesota suspect Paul Wellstone might have been when he became a thorn in the side of the powers that be? In that regard, while we do live in an age that resembles in many respects the world in which Roosevelt lived, it is also an age in which the wealthy have refined their slight-of-hand tactics to very effectively manipulate the strings of power, clandestine maneuvers have become the order of the day, and the corporations have become owners of most, if not all, of the public media. One must wonder if Warren’s voice, as an example, would be allowed to be heard if that voice was saying the kinds of things the media don’t want the people of this country to hear? Gone is the “Golden Age of Journalism.” McClure’s Magazine is no more. Now we have Fox News and the corporate-owned media simply entertain; they provide precious little information. Where are the voices that need to he heard? These are interesting questions, and it remains to be seen if there is anyone in the political arena who, with or without the help of the third estate, is willing and courageous enough to take on the powerful lobbies and corporations that support them and go toe-to-toe with the unscrupulous powers that pull the strings in Washington. And if there is anyone courageous enough, will they be able to swim against such a powerful current? If the answer to these questions is “no,” then we are not likely to see another Teddy Roosevelt emerge, take the country in hand, and lead it out of our present morass. What then? I apologize to readers for continuing to circle back to the question of the types of people we revere as heroes. But I have always thought, since I first read Homer’s Iliad, that the heroes a culture admires tell us a great deal about that culture and the values it holds dear. My most recent blogs were about the sad examples of Michael Jordan who seems to be totally self-involved, and the group that picketed after the death of the renegade cop, who seem to be simply misguided. In both cases, it seemed to me, we had examples of types of persons who are hardly admirable, much less heroic. But I have found a person who is worthy of the title of “hero.” It is Elizabeth Warren, a first-term Senator from Massachusetts who is not only sharp but also a woman of principle who seems willing to take on the powers that be. She is like a breath of fresh air in Washington – the city of stale air and an excess of money and lazy self-interest. 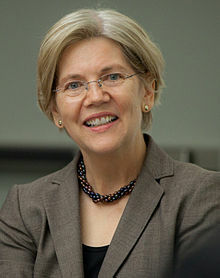 A recent story that has gone “viral” on You-Tube shows Senator Warren taking on bank regulators over the issue of penalties for ripping off the public. You remember: the banks are the types this government bailed out recently with a slap on the wrist. They apparently paid their fines with some of the $700 billion they received from the government to help bail them out of the difficulties they got themselves into. Iceland, in contrast, simply let their failed banks go under and the government bailed out the investors. And their economy at present is in fine shape, thank you very much. “I will have to get back to you with specific information,” Walter said as the audience tittered. . . . If you haven’t seen the video, you owe it to yourself to check it out (here). Warren is relentless. All she needs is a white charger or a cape and her image would be complete. The bank examiners look very uncomfortable and, try as they will, they are unable to prevaricate, a dodge they are very skilled at. It will be very interesting to see if Senator Warren is able to have a major impact in a city that seems to swallow up principled politicians. In the meantime, I simply say: Go Elizabeth! !